Destination Engagement Shoot..On the Rocks! In the throes of getting engaged and officially initiating the wedding planning process, you not only have to make sure that the bridal party, groom party, wedding venue, reception venue, food, invitations and other tedious things are thought about, but first and foremost, you also have to add in the extra task of figuring out where you want to take your engagement photos! 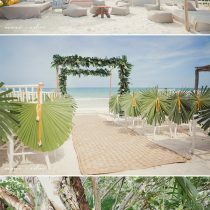 This destination engagement shoot by Stephanie A. Smith Photography gives a great guide on how to keep it stress-free. If you’re planning on doing a destination engagement shoot, it’s best to have also picked that destination for the wedding day as well. This will help eliminate a lot of back and forth while trying to juggle two very important locations. The ease of the beach helps you relax a little more into your natural setting, forgetting that the camera was even there! Great choice Jatana and Matt! Here’s to looking out into the sunset for the rest of their lives! Just the venue is stress-free 🙂 Great pics!! Thanks Andreina and Sara, glad you like it! 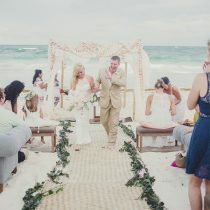 Very lovely setting- you’re so right about the beach being a great way to relax you for a photo shoot! Love her cute, boho-chic look! Thanks, Tamika! The beach is definitely an awesome place for photo shoots.